Martin Freeman leads a sturdy cast in a trio of terrifying tales that recalls "Twin Peaks" and "Eraserhead." Courtesy of IFC Midnight. An IFC Midnight release. The popularity of ghost stories are a cultural puzzle: They freak us out, but we can’t get enough of them. But the appeal of ghost stories goes beyond the thrill of being scared; it’s about finding the answers to life’s biggest question — what happens to us after we die? “Ghost Stories” tackles this age-old question with a fresh and chilling take on the supernatural that offers up three tantalizing stories of the unexplained, building to a shocking twist ending. 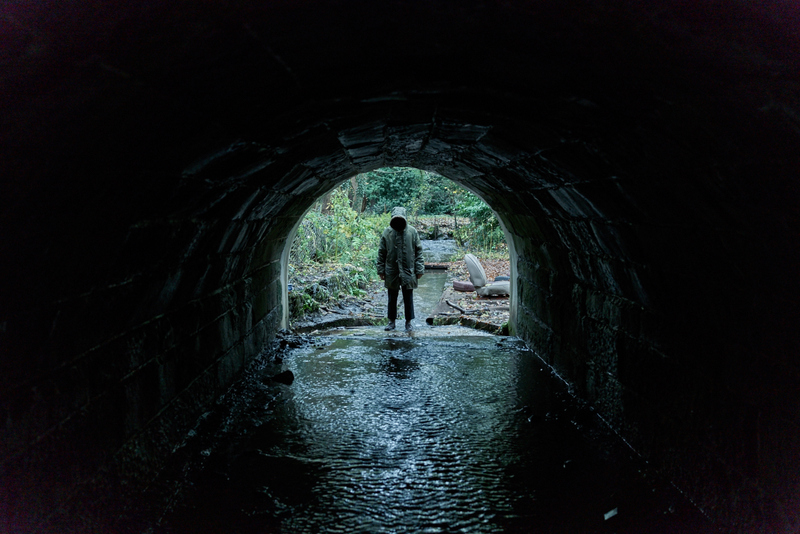 The anthology horror film, based on a stage play by the film’s co-writers and co-directors, Jeremy Dyson and Andy Nyman, translates well to the big screen. The staginess of the source material steeps the film in an uncanny atmosphere, where the secrets of the past bleed into the present. Actual ghosts might not be real, but the memories we repress are, and they can haunt us in ways we might not expect. Professor Phillip Goodman (Nyman) is the host of a television program that applies rational explanations for ghostly encounters and exposes modern day charlatans. Despite dashing the hopes of people seeking solace, Goodman enjoys his work, and he’s ruled by the rational to an almost cocky degree. (The truth is out there, but sorry Mulder, it’s just shifty humans trying to make a dirty dollar.) When Goodman’s mentor offers him three tantalizing cases to investigate — the only three cases he was never able to debunk, which just might contain evidence that the supernatural does exist — Goodman (and his ego) can’t resist. Goodman’s investigations treat the audience to three chilling vignettes. The first, follows Tony Matthews (Paul Whitehouse), a nightwatchman who is haunted by the ghost of a young girl while working the graveyard shift at an abandoned mental institution. The second case is Simon Rifkind (Alex Lawther), a frazzled young man who cannot find peace until he understands the terrifying things that happened to him when his car broke down in the woods. The final case Mike Priddle (Martin Freeman), whose home is haunted by a poltergeist with a chilling message to relay about his pregnant, hospitalized wife. Until the first vignette, “Ghost Stories” is rooted in rational explanations. However, with each new story, the terror each person experienced in the past begins to leak into the present, surprising Goodman, and the audience, at every turn. He’s haunted by phenomena he can’t explain — a hooded figure lurking behind him, the same sequence of numbers appearing in different forms, and even a ghostly apparition of himself. The movie relies on effective jump scares that maintain uneasiness throughout, nudging the film into the unnerving sense that nothing can be trusted. As the film’s ominous qualities continue to build, “Ghost Stories” leans harder into the more surreal aspects of horror, the kind that made “Twin Peaks” and “Eraserhead” so enduring and unforgettable. These are the scariest moments in “Ghost Stories” — David Lynch-like flourishes that find Goodman entering the Rifkind home as Simon’s parents silently staring at the walls with their backs to him, or Matthews wandering an abandoned cell in the insane asylum and finding the walls lined with children’s mannequins. Like many of the more unsettling images Lynch offers in his work, these moments trigger questions with no clear answers, leaving viewers in a jittery state throughout. Much like real life, the biggest scares in “Ghost Stories” come from the fleeting shadows and unfocused glimpses of the unexplained phenomena that let the audience’s imagination run wild. But when the film offers full glimpses of the horrors in question, it falls short of payoff. Special effects are a tricky proposition in any genre, but especially horror, and they simply can’t meet the market standard here. But these moments are fleeting, and offset by plenty of solid jump scares and eerie moments that keep the film’s tension on track. In the end, the three vignettes weave together and force Goodman to confront his past, yielding a shocking finale that that pays off in spades. Even if you see this one coming (and there are plenty of hints), “Ghost Stories” packs a gut punch of an ending that begs for multiple re-watches, and reminds us that the most haunting thing of all are the secrets we keep from ourselves.